Become the health care provider you’d like to have. If you believe in treating the whole patient rather than just a condition, then consider a truly rewarding career in holistic medicine. As more and more individuals seek treatments that supplement or prevent the need for conventional, western medicine, the career opportunities in holistic medicine multiply and flourish. Holistic medicine practitioners are trained as primary care providers. They learn to treat all aspects of family health and wellness, from pediatrics to geriatrics. Their scope of practice may include everything from nutrition and botanical medicine to clinical diagnosis and pharmacology. In fact, if you’re interested in a career in health care, then you’re in luck, because it’s a thriving field of expansion and change. Current growth and other positive trends make today a good time to become a holistic medicine practitioner — especially since the future prognosis for job demand in this field looks equally bright. The current health-care system is undergoing a crisis: There are currently not enough medical practitioners to meet health care needs, the prevalence of chronic disease has skyrocketed, and people are seeking new options. 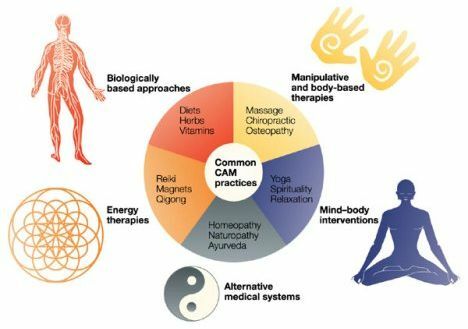 complementary and alternative medicine providers may play an integral part, and a preventive, wellness-oriented focus takes its rightful place at the forefront. The attitudes and expectations of health care consumers are arguably the most significant determinants of holistic medicine’s viability. People are living longer, and they are seeking a higher quality of life, expecting more than just pharmaceutical symptom management. For this reason, holistic and natural health care appeals to many health-conscious individuals. Today’s population has an increasing interest in wellness practices and therapies, a growing desire for healthful aging techniques, and a renewed focus on prevention and self-directed lifestyle changes, such as dietary strategies. Out-of-pocket payment for such services is becoming increasingly common, as is health insurance coverage. Throughout the world people are visiting holistic practitioners more frequently and spending more on natural health care services and products. A recent survey noted that more than a third of consumers use complimentary and alternative medicine. More specifically, the number of adult visits to holistic practitioners rose 46 percent over a recent five-year period. Many governmental labour departments predict that consumer demand for alternative health care will continue to grow because of research and changing attitudes about alternative, noninvasive health care practices. Governments also forecast that employment of physicians and other health care practitioners will grow faster than average for all occupations through 2018, driven in large part by the rapidly increasing older population. With so many harbingers of success and expansion, the future of this progressive field looks healthy indeed, for patient and health care practitioner alike.